First give thanks to Vicky (equipment and support), to Josh (for hosting and permitting), to everyone (for coming). Then reflect: I don’t really know my own work, don’t know what I’m doing, why I’m doing it, how to place the what and why in a conversation, or much less in the conversation. Which means that this evening I expect to find the conversation. Or more of it. Say what I will do: show and tell, walk through three works… by doing the most boring thing in the world: navigating through websites while asking someone to watch… and I’m not that good at it. Forgive me in advance. Give the following warning: I’m a terrible story-teller… because while one-thing-after-another comes naturally to me, arc does not, plotting does not. Talk about collaboration with Finley, which began in ’88 or ’89 and has continued on and off—mostly on—since then. 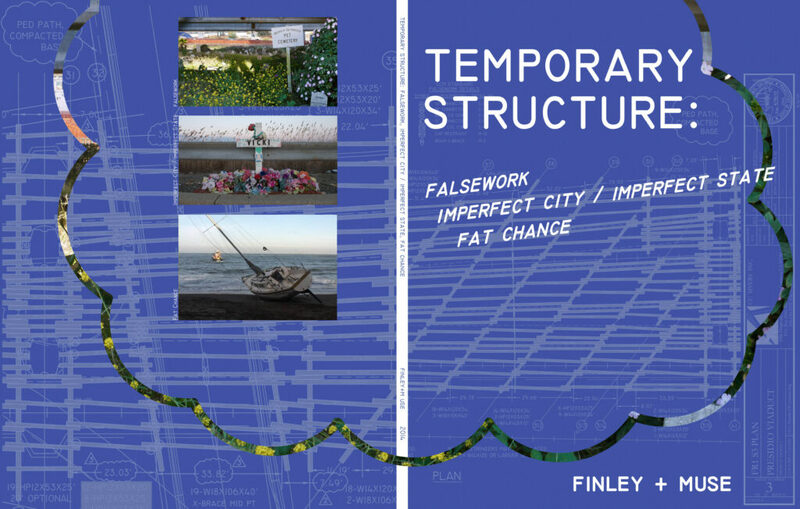 The three works that comprise Finley+Muse’s Temporary Structure engage with loss, remembrance, landscape, the built environment, and the material culture of grief. The title comes from the definition of “falsework,” a term used by architects and engineers to define “temporary structures used in construction to support, protect, provide scaffolding for, or shore up other architectural components of the construction zone.” Finley+Muse present these three works together to take the term “falsework” beyond the physical support to the stories, images, and sounds that evoke both the memorialized and the memorial builders. Talk about The Ardmore Cairn as gateway drug to show at the DCCA: Imperfect City / Imperfect State; show the film. Talk about Jeanne’s film Fat Chance; show the film. Jeanne and I were approached by Laurie to propose a piece for senseofplace Lab, “an artistic laboratory that collaborates with interdisciplinary partners to develop projects that heighten a ‘sense of place.’” She offered us a few ideas for sites and situations. Including the Pet Cemetery. We immediately seized on the Pet Cemetery as a site, not only because Cemeteries are cool—in a few senses of that word—not only because Pet Cemeteries are cooler, not only because we adore human and non-human animals, and not only because of current interests in the material culture of grief, the affective forces, the feelings, that we pull around ourselves to shelter us from loss and which sustain that very loss and sustain us as well—we seized on the Pet Cemetery as site because of this truly monumental, yet temporary, structure above it, which we’ll view and talk about more once we’re up at the top of Cowles and Lincoln. We have a few pages on our website to aggregate this info. As importantly, we’ve built out a few geocache components, which we’ll talk about in detail at the end of the walk for those that are interested. But for now let me say that we’ve placed a cache nearby, called appropriately, “Falsework,” and we’ve created pairs of Falsework travel bugs, avatars of people and animals that we’ve separated and which geocachers are invited to pair up again. Conclude by talking about the larger ambitions of Temporary Structure.